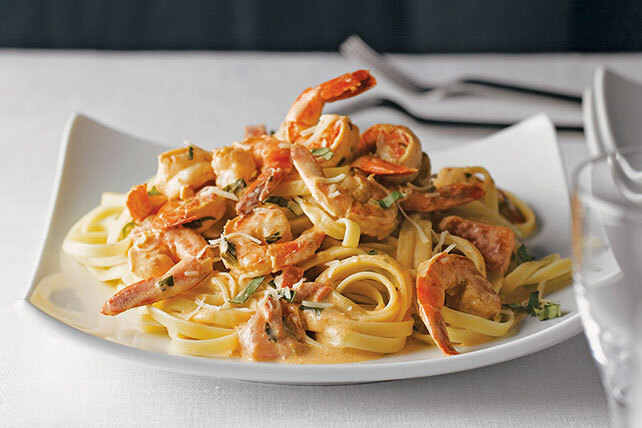 Share something special with our Easy Shrimp Fettuccine Recipe for Two. This shrimp fettuccine recipe, with tomatoes and basil, is a tasty weeknight option. Pour dressing over shrimp in small bowl; stir until shrimp are evenly coated. Refrigerate 20 min. to marinate. Cook pasta as directed on package, omitting salt. Meanwhile, heat large skillet on medium heat. Add shrimp; cook 3 min. or until shrimp turn pink, stirring frequently. Remove shrimp from skillet; cover to keep warm. Add tomatoes, cream cheese and 1 Tbsp. basil to skillet; cook and stir 3 min. or until cream cheese is completely melted and sauce is well blended. Add shrimp; cook 2 min. or just until heated through, stirring frequently. Drain pasta; place on platter. Top with shrimp mixture, remaining basil and shredded cheese. Prepare using thawed frozen cleaned shrimp. For a thinner sauce, stir small amount of milk into sauce along with the shrimp.